This sunglass rack is priced right at only $45. These counter top style sunglass displays are great for shops with not a lot of room. You can place this display on a counter-top close to your cash register and keep an eye on it easily. 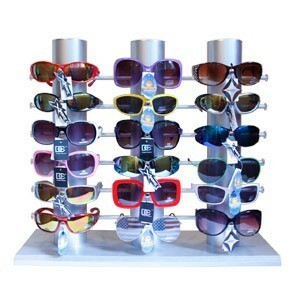 If you are looking for a locking sunglass display we have models you might want to look at. • Height 18 in. x Width 22 in.